Here are some important factors to consider before installing an awning. An awning is an excellent addition to your home because it can provide you with a host of benefits. Not only will you be getting a structure that shields you from the elements, but you can also save on energy’s cost and boost your home’s aesthetic value as well. Even though these perks sound great, it’s important to make some important considerations before you have one installed. Here are a few of them. This is probably the first thing you should think about when deciding to have an awning installed. Thinking about your awning’s placement will have a lot to do with the purpose you’re using it for. Are you trying to block sunlight and rain? Is it intended to protect your porch? Your answers to these questions will help you decide the type of awning you need as well as other questions that may arise, like how big it should be and which fabric you should use. It’s also critical to consider how your awning will be mounted before you have it installed. Awnings need a sturdy place to be mounted, so you should make sure that you know how your awning will be mounted. The way you mount your awning will determine both its height and its slope, which can both influence how they function. 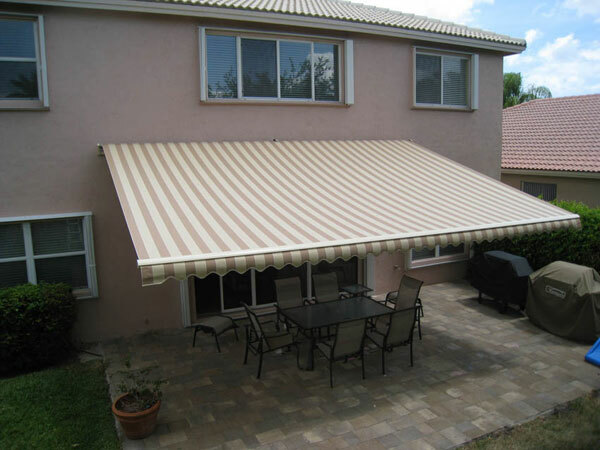 Make sure your awning is mounted well to ensure the safety of people who will walk under your awning. A professional can help you make sure that’s the case. Having a motorized awning can provide you with a level of convenience that makes using your awning very easy. Non-motorized awnings have their perks too though! It’s up to you to think about what your needs are. Do you need an awning to retract on its own? If so, you’ll want to opt for a retractable awning. Retractable awnings are convenient for several reasons, but in the winter they can truly show their good qualities. Before there’s a big snowstorm, you can simply retract your awning before it happens.